Brothers Phil, Derek and Ray Shulman endured an uncomfortable early brush with stardom prior during the late 60s. All talented multi-instrumentalists, the three siblings grew up in Glasgow and had a collective love of jazz, soul and blues. After their army musician turned jazz trumpeter father relocated the family to Portsmouth in the early 60s, the boys gigged extensively as R&B band The Roadrunners before signing to EMI/Parlophone and renaming themselves Simon Dupree And The Big Sound. Despite viewing themselves as purveyors of blue-eyed soul, however, their new label encouraged them to embrace psychedelia, and the group subsequently scored a UK Top 10 hit with the evocative, psych-pop-flavoured ‘Kites’ in the autumn of 1967. The Big Sound’s lone LP, Without Reservation, also squeaked into the UK Top 40, but subsequent singles, including ‘Broken Hearted Pirates’ (which featured an uncredited Dudley Moore on piano), made little headway in the charts. After disillusionment set in, the group disbanded late in 1969. Desperate to escape the strictures of commercial pop, the Shulmans re-engaged Big Sound drummer Martin Smith and sought out musicians of a similar virtuosic calibre for their new venture. Having successfully recruited two dextrous multi-instrumentalists, Gary Green and classically trained keyboardist Kerry Minnear, they became Gentle Giant and signed with Philips/Phonogram’s prog-rock offshoot Vertigo, who paired them off with David Bowie/T.Rex producer Tony Visconti to record their self-titled 1970 debut. Between them, Gentle Giant were masters of a dizzying array of instruments and, as five of the six members were consummate singers, they could also write and perform complex vocal harmonies. Accordingly, their self-titled 1970 debut album was highly virtuosic, even by prog’s exacting standards, and its seven tracks skipped restlessly between styles, swiping elements of blues, rock, classical and 60s soul as required. 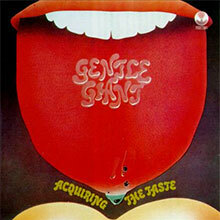 Arguably more successfully realised, however, was the group’s second Visconti-helmed LP, Acquiring The Taste. In the sleevenotes, Gentle Giant infamously (and ironically) declared “it is our goal to expand the frontiers of contemporary popular music at the risk of becoming very unpopular”, and the album was indeed notably more experimental than its predecessor. Yet it was by no means without merit. Though Kerry Minnear’s baroque and classical influences often came to the fore, and the songs embraced exotic textures ranging from Gregorian chants to Mellotron, celeste and clavichord, tracks such as the chameleonic ‘Pantagruel’s Nativity’ also rocked very hard indeed. Following that album’s release, drummer Martin Smith quit and Malcolm Mortimore replaced him behind the traps. 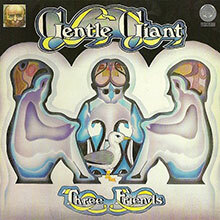 Gentle Giant then self-produced their third LP, 1972’s Three Friends: their first fully-blown “concept” LP, which was based around a storyline not dissimilar to the one central to The Jam’s Setting Sons in that it involved three inseparable school friends who were “separated by chance, skill and fate” as they grew into men but eventually rekindled their friendship in later life. However, listeners didn’t have to be cognisant with the intricacies of the plot to enjoy the individual tracks, and while symphonic classical stylings and hard-edged blues-y rock again formed the record’s stylistic bedrock, its follow-up, Three Friends, was notably more cohesive than Acquiring The Taste. Its relative accessibility paid off too, as the album sold well in North America and even sneaked into the lower reaches of the Billboard 200. 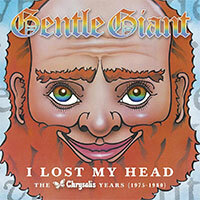 Gentle Giant again changed drummers after Three Friends, with hard-hitting ex-Grease Band/Wild Turkey skinsman John ‘Pugwash’ Weathers replacing Mortimore. 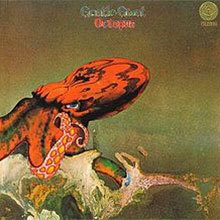 This line-up recorded December ’72’s Octopus, so named because it consisted of eight tracks, and Phil Shulman’s wife Roberta jokingly referred to it as the band’s “octo opus”. Acclaimed by fans and critics alike, it was another diverse and challenging affair, with the ambitious, excitable ‘The Advent Of Panurge’ reputedly inspired by French Renaissance writer François Rabelais, and the complex, madrigal-esque vocal workout ‘Knots’ based upon Scottish psychiatrist RD Laing’s book of the same name. Octopus again cracked the Billboard 200, and Gentle Giant continued to tour, though they were dealt a major blow when Phil Shulman quit, owing to a combination of internal disagreements and a somewhat mismatched billing where the band were booked to support metal icons Black Sabbath. Rocked by Phil’s departure, Gentle Giant considered splitting but eventually regrouped as a quintet to record September 1973’s In A Glass House. A hard-edged concept LP based around the aphorism that “people in glass houses shouldn’t throw stones”, it was released to a groundswell of critical applause and showed that the band had bounced back following Phil Shulman’s departure. Released in September ’74, sixth album The Power And The Glory was also an engaging concept LP based around an Animal Farm-esque theme involving political power and corruption. Again critically hailed on both sides of the Atlantic, it was also the first of Gentle Giant’s albums to be issued by Capitol in North America, and it performed highly respectably on the Billboard 200, where it peaked at No.78. Stateside success continued with 1975’s Free Hand, which climbed to No.48 on the Billboard 200 and significantly raised the band’s profile. The band’s debut for Chrysalis in the UK, Free Hand was still breathtakingly diverse in scope, taking in Renaissance/mediaeval influences (‘On Reflection’), folk (‘Mobile’) and even bucolic, Tudor-flavoured instrumentals (‘Talybont’), but it was also polished and accessible, and it arguably remains Gentle Giant’s most popular and widely acclaimed LP. The band returned in 1976 with another “concept” LP, albeit a subversive one. Conceived around the idea of an imaginary radio interview with the five band members, Interview pointedly criticised the state of the music industry and the marketing-related stunts some artists are required to endure in order to achieve mass success. The band even roped in music journalist Phil Sutcliffe to bring further credibility to the project, but while this satirical – and underrated – album included eclectic treats such as the ‘Dreadlock Holiday’-esque white reggae of ‘Give It Back’ and the glorious, a cappella ‘Design’, it met with mixed reviews and stalled at No.137 on the Billboard 200. Regardless of Gentle Giant’s fluctuating commercial fortunes, however, the group remained a hugely popular live draw. Touring almost constantly, they frequently shared stages with prog-rock contemporaries such as Jethro Tull and Yes, and their inherent virtuosity ensured they were always an electrifying live act. Showcasing the band on vintage form, 1977’s live double-set Playing The Fool presented a stylish, confident capture of the best of four shows on the European leg of the Interview tour, wherein Gentle Giant performed tracks from all their studio LPs barring Acquiring The Taste. However popular they were treading the boards, outside forces conspired to dictate Gentle Giant’s future from hereon in. By 1977, with punk very much in vogue, “prog” was seen as a dirty word and Gentle Giant (as well as their contemporaries such as Yes, Genesis and Jethro Tull) were regularly condemned as yesterday’s men by younger writers in the music press. 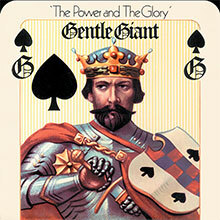 Apparently undeterred, Gentle Giant responded by releasing The Missing Piece, a quixotic work which included the cute, feel-good pop of ‘Two Weeks In Spain’; heartfelt power ballad ‘I’m Turning Around’; and even a concession to the industry’s new world order, courtesy of aggressive, shape-throwing rocker ‘Betcha Thought We Couldn’t Do It’. Though highly commendable, The Missing Piece only briefly showed up at No.81 on the US Billboard 200, and didn’t trouble the charts in the UK at all. A concerted attempt to arrest the band’s commercial decline, 1978’s much-maligned Giant For A Day!, meanwhile, was Gentle Giant’s attempt at a straight-up rock/pop LP, banishing all vestiges of mediaeval music, multi-layered harmonies and the band’s usual battery of arcane string and wind instruments. Despite this radical reinvention, the record backfired critically and commercially, even though it contained some highly commendable material such as the Steely Dan-ish ‘No Stranger’ and two lean, hungry rockers, ‘Rock Climber’ and ‘Little Brown Bag’, which showcased Derek Shulman’s commanding vocal prowess. Chrysalis gave Gentle Giant a final roll of the dice with 1979’s Civilian, pieced together from sessions in California helmed by The Beatles’ long-time engineer Geoff Emerick. In thrall to new wave, it was another linear pop/rock platter, but while it proffered potential hit singles such as the muscular ‘Number One’ and infectious ‘All Through The Night’, band, label and critics alike were indifferent to the results. Following a short tour, Gentle Giant took their final curtain after a show at Los Angeles’ Roxy Theatre in June 1980. Barring Phil Shulman, the band have all remained active within the industry. John Weathers drummed for Welsh rockers Man and enjoyed a second spell with Wild Turkey. Gary Green settled in Chicago and went on to play with numerous Illinois-based bands, and the Cornwall-based Kerry Minnear now runs Alucard Music, which has supervised CD and DVD reissues of Gentle Giant’s music. Derek Shulman, meanwhile, enjoyed a distinguished career in A&R and spent time as president of the Atco and Roadrunner labels, while his younger brother Ray remained in the studio during the 80s and 90s, producing landmark LPs for renowned artists such as The Sundays, The Sugarcubes and Echo & The Bunnymen frontman Ian McCulloch. Returning to Gentle Giant's fourth album after any kind of lengthy absence, it's astonishing just how little Octopus has dated. 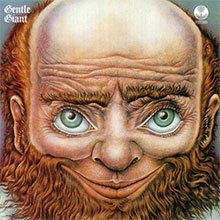 Often written off at the time as a pale reflection of the truly gargantuan steps being taken by the likes of Jethro Tull and Barclay James Harvest, the band's closest relatives in the tangled skein of period prog, Gentle Giant often seemed more notable for its album art than its music. Octopus, however, marries the two seamlessly, with the cover speaking for itself, of course. And the mood continues within, the deliciously convoluted opening "The Advent of Panurge" itself riding waves of sonic tentacles as Gary Green's guitar shrieks short but so effective bursts around the thundering bass and, occasionally, churchy organ. Against the pulsating volume of the album's heavier tracks -- "Panurge" is joined by "A Cry for Everyone" -- the band's excursions into less excitable territory are never less than captivating. Twiddly though they are, the sometimes a cappella "Knots," the lilting "Dog's Life," and the Yes-with-fiddles-ish "Raconteur Troubadour" all have moments of sublime sweetness, while the instrumental "The Boys in the Band" is a succession of quirky showcases for, indeed, all the boys. Occasionally arrangements do get overly cluttered -- with each of the six bandmembers doubling up on at least three different instruments, there's a distinct sense of overdubs for overdubbing's sake. Follow the key instruments alone, however, and the soundscapes not only make perfect sense, but so do the flourishes and intrusions that rattle around. And the end result is an album that has withstood the test of time a lot better than anyone might have expected. Astonishingly daring debut album, not as focused or overpowering as King Crimson's first but still crashing down barriers and steamrolling expectations. The mix of medieval harmonies and electric rock got stronger on subsequent albums, but the music here is still pretty jarring. Kerry Minnear was probably the only prog rock keyboard player of the era who allowed his synthesizers to sound like themselves and not mimic orchestras; Gary Green's guitars are alternately loud and brittle or soft and lyrical, and always surprising; and the presence of saxes and trumpets (courtesy of Phil Shulman) was unusual in any rock band of the era -- all of which explains how Gentle Giant managed to attract a cult following but hadn't a prayer of moving up from that level of recognition. "Funny Ways" was the softest prog rock song this side of Crimson's "I Talk to the Wind," but a lot of the rest is pretty intense in volume and tempo changes. "Nothing at All" by itself is worth the price of purchase. 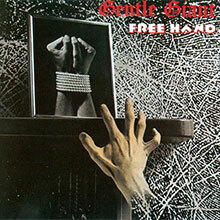 Gentle Giant's third album (and their first self-produced effort, Tony Visconti having run the sessions on the two previous records) was another advance, this time in the direction of a harder rock sound -- everything sounds turned up here, especially the guitars, the bass, and the electronic keyboards. Three Friends hardly sacrificed any of the group's progressive intentions, however, and there are some softer moments here, such as the playful, sprightly first half of "Schooldays"; the harmonies and arrangements still had a distinctly medieval feel, and the melodies, though a little harder to discern here (which made them even more appealing when they did become obvious), were quite engaging. This is supposed to be a concept album, about the relationship between three friends across a lifetime, and the original notes and lyrics have been reprinted, but none of that is necessary in order to enjoy the songs here. The band's second album is a major advance on its first, featuring superior singing, playing, and songwriting, as well as a more unified sound, without sacrificing the element of surprise in the first record. Many of the melodies and even the riffs here (check out Gary Green's first guitar flourish on "Pantagruel's Nativity") have a pretty high haunt count, and all of the musicianship displays an elegance seldom heard even in progressive circles -- but the record also, amazingly enough, rocks really hard as well. Elements of hard rock and Gregorian chants mix freely and, amazingly enough, well throughout this album. The group's first U.S. release in two years featured ornate playing from Kerry Minnear on keyboards and Gary Green's loudest guitar work up to that time. The Power and the Glory is also a fairly dissonant album, yet it made the charts, albeit pretty low. There seems to be a unifying theme having to do with one's place in the social order, but it's very vague in contrast to Pink Floyd's re-creations of the post-'60s drug experience, Yes' sweeping album-length suites, and ELP's sci-fi epics. "No God's a Man" is an infinitely more challenging piece of music than anything on Jethro Tull's Aqualung, but that wasn't a commercial virtue; nor could the electric violin break on "The Face" or the rippling electric guitar passages throughout cover the effort involved in absorbing these songs. The Power and the Glory vaguely resembled Genesis' early art-rock albums, but without any presence as charismatic as Peter Gabriel. "Playing the Game" and "So Sincere" were the most accessible tracks and ended up as key parts of their concert set. Free Hand is perhaps Gentle Giant's most realized effort. After the excellent In a Glass House, the group further developed its Renaissance-medieval approach, producing one of the most creative and complex recordings in progressive rock history. Their vocal approach to the four-part fugue "On Reflection" was revolutionary for its time and is looked upon as one of the genre's defining moments. Despite the complexity of the arrangements, the music never sounds academic and in fact is very accessible thanks to several melodic hooks. The combination of superb musicianship, dry wit, and creative compositions make this an essential and historical recording. UK four CD collection from the British Prog Rock band that rounds up all of their Chrysalis albums with bonus tracks including John Peel sessions, 7" mixes, live tracks, 'b' sides and more. Gentle Giant was born out of the ashes of Simon Dupree & the Big Sound, a successful UK rock and R&B-based outfit led by the Shulman Brothers. In 1970, the brothers founded Gentle Giant. Derek was lead vocalist and played alto sax and bass, Ray sang and played bass and violin, and Phil handled the saxophone and added vocals. Kerry Minnear, on keyboards, came straight from the Royal Academy of Music, and Gary Green became guitarist. John Weathers joined the band in 1972 and was the drummer for two albums. Gentle Giant's utilization of complex classical chord and time patterns, together with hard rock, blues, jazz and even medieval melodies, set them apart from other "progressive" groups of their time or since. Gentle Giant were one of the most celebrated progressive rock bands to emerge from the U.K. in the '70s, marked by their ambitious compositions that melded elements of classical music with rock and performed with the dynamics and force of a virtuoso rock ensemble. While Gentle Giant never rose to superstardom, they had a truly loyal following and through most of the '70s they recorded and toured regularly, leaving behind a striking and diverse body of work. Memories of Old Days: A Compendium of Curios, Bootlegs, Live Tracks, Rehearsals and Demos 1975-1980 is a five-disc box set of rare and unreleased material, dominated by concert recordings and rehearsal tapes but also including demos, studio outtakes, and glimpses into the recording process. 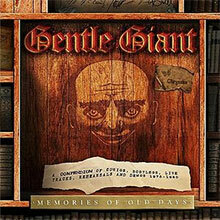 For fans who embraced the earlier box sets Scraping the Barrel and Under Construction, Memories of Old Days offers a deeper look into Gentle Giant's archive of rarities.